Counselors found the most value in college planning, course exploration and planning, individualized learning plans, providing SEL resources, and working with students toward graduation and post-secondary education experiences. Counselors also highlighted the usefulness of Naviance in terms of communicating with stakeholders such as students, teachers, administrators and families. Read on for additional detail, or read the full report here. New technologies are pervasive in the counseling profession. School counselors are experiencing a growing field of technologies that include virtual counseling platforms, smartphone applications, and learning management systems that provide the ability to see students face-to-face, quickly access information through an application, and offer high school students resources and information ultimately assisting in the school-to-work transition. Additionally, the education field recognizes the value of integrating new technologies into practice to support student outcomes as well as counselor growth, job efficiency, and productivity in the areas of academic, social, and emotional development and college and career readiness. Because K–12 schools have spent billions of dollars integrating new technologies in schools to support academic achievement, it was important to investigate school counselors’ use of Naviance, an online college and career readiness tool, and examine how Naviance usage enhances middle and high school counselors’ practices, productivity, and efficiency. Within the school counseling profession, counselors use technology daily, such as retrieving information, sending email, developing newsletters, and creating multimedia presentations, which are considered relatively easy tasks. Yet, school counselors’ attitudes toward the use of new technologies is negative. It is important to note that there are external forces that shape a school counselor’s perceived ease of use and usefulness of the technology, and these forces, such as limited training with the new software, age of the user, and high student caseloads, may negatively affect attitudes. For this study, the Technology Acceptance Model (TAM) was used for the theoretical framework. TAM is comprised of four constructs: perceived ease of use, perceived usefulness, attitudes, and actual behaviors. Data sources collected for this qualitative dominant crossover mixed analysis study included a survey questionnaire, face-to-face semi-structured interviews, and Naviance staff usage and engagement reports. The researchers used a level 1 quantitative analysis, which includes descriptive data taken from usage and engagement reports, and percentages from the questionnaire to determine productivity and efficiency. 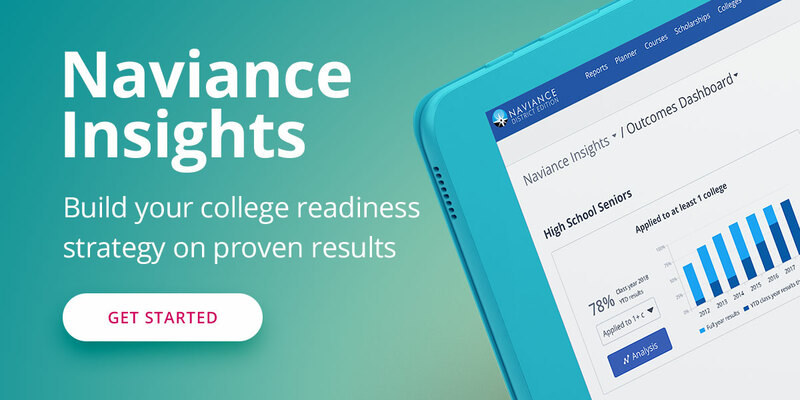 Overall, school counselors indicated that Naviance was easy to use and useful in their role. They further stated that the use of Naviance positively enhanced their job productivity, efficiency, and counseling practices. Particularly, the ability to introduce college-related material to help students develop individual education plans, identify courses, provide social and emotional resources, and advise on graduation status and college eligibility, was positive. In addition, more school counselors are using Naviance as a vehicle to share information with teachers, administrators, and parents.